In Branstad's Iowa, corn creams you. Iowa governor Terry Branstad won’t endorse any presidential candidate ahead of the state’s upcoming caucuses. But on Tuesday, Branstad said there is one candidate he’s not endorsing the most. If you’re wondering why a Republican governor is so concerned with protecting renewable energy against the influence of “Big Oil,” remember that Iowa’s economy is addicted to hard-core corn. The Renewable Fuel Standard mandates that gasoline refiners mix a certain amount of ethanol or other biofuel into their product — a policy with dubious benefits for the environment but indisputable benefits for Iowa’s corn growers. Gas refiners hate the RFS, and so do free-market purists. So it’s not surprising that a Texas senator with libertarian economic leanings would oppose it. In 2013, Cruz co-sponsored legislation to immediately repeal the standard, then introduced his own legislation in 2014 that would phase out the program over a five-year period. 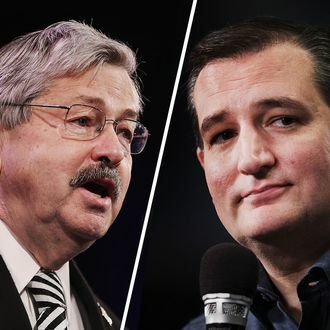 Such proposals have not endeared Cruz to Governor Branstad’s son Eric, who heads up a bipartisan ethanol lobby called “America’s Renewable Future.” Branstad the younger’s group has taken to tailing the Cruz campaign bus, passing out anti-Cruz pamphlets at the senator’s events. Cruz has a narrow lead over Donald Trump in polls of likely caucus voters. If Cruz is able to maintain that lead in the face of vocal opposition from both the state’s governor and the corn lobby, it would lend credence to the theory that, in modern America, “all politics is national.” Over the weekend, the New York Times reported that, as Republicans have become more intensely ideological, the influence of local concerns and interest groups has waned. The growing supremacy of national political identity over local economic interests has been driven in no small part by the proliferation of conservative media. And on Tuesday, Iowa’s leading conservative talk-radio host Steve Deace argued that Branstad’s slight was “good news” for Cruz. Terry Branstad finally does conservatives a favor by telling us all who the establishment really hates -- Ted Cruz. It's good news Tuesday!